How much do the government and private corporations know about you? How much can they find out? And to what uses will they put this information? These are the questions posed in this chilling documentary that charts the unimaginable limits of the modern information state. An ordinary, law-abiding man discovers he is being watched all the time as if he were a criminal in the suspenseful Erasing David , a masterwork of first-person filmmaking that suggests we all have reason to feel paranoid. This bold, highly personal movie will put it all out there when it arrives on DVD from FilmBuff and MPI Media Group on June 28, 2011, with an SRP of $24.98. In order to discover how much privacy he has left, British actor-filmmaker David Bond (Pie in the Sky, Lions Are Green) sets out to disappear from his own life by hopping around random European locations in the U.K. and the continent. Leaving behind his pregnant wife, Katie, and their young daughter, as well as the conveniences of modern life, Bond tries to go completely underground. But with a pair of topnotch private detectives � Duncan Mee and Cameron Gowlett, hired by Bond himself! � on his trail using all the information that the surveillance society has made available, Bond finds his task far trickier than he imagined. He learns, among other disturbing things, that every phone call he has made, every bill he has paid and every website he has visited provide vital information to someone determined to find him. "Fascinating and chilling," said Ain't It Cool News of Erasing David . "An enterprising British documentary from David Bond, fashioned into an almost Bourne-style thriller," wrote Tim Robey of The Guardian (UK). The movie "keeps us gripped while it explores big issues that affect our everyday lives," said Rich Cline of Shadows on the Wall. 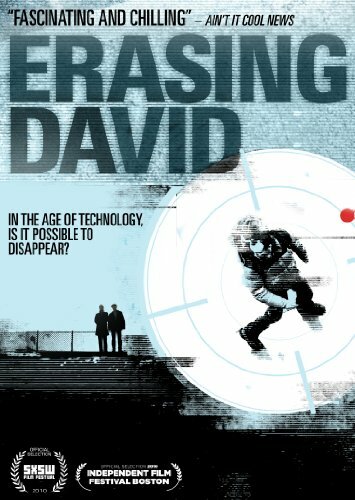 Erasing David , with its powerful echoes of the work of Morgan Spurlock and Michael Moore, the financial-crisis documentary Collapse and the thriller The Bourne Identity, was an Official Selection at both the 2010 Independent Film Festival Boston and the 2010 SXSW Film Festival.